So after the recent White House response about Death Stars (well only one) we were talking in the office about how powerful it would need to be to destroy Jupiter (obviously just the power of one Death Star to destroy Earth, right?) and also, if a puny laser won’t work against Jupiter, what effect would deflecting our moon into Jupiter have? On the one hand we have the Death Star. The Death Star blows up Alderaan without breaking a sweat, vaporising most of the planet’s mass and giving the rest a decent whack of kinetic energy. One of the weird things about impact physics is that it tends not to draw much distinction between something you just manage to disrupt and something you destroy so completely there’s little of the target body left, but Alderaan is an outcome very much towards the latter end of the scale. If we assume that Alderaan is analogous to one Earth (it certainly seems to be in the film) then we can say that the Death Star is more than capable of disrupting planets even larger than the Earth, and that one Earth is merely the lower bound of its destructive power. On the other hand we have Jupiter. Jupiter is the big boy of the solar system; it might be slaved to the Sun but otherwise it runs the show, gravitationally speaking. The orbits of nearly every other body in the solar system are highly sensitive to their resonances with Jupiter, which has 318 times the mass of the Earth. Since gravity is the primary factor in determining how hard a particular body is to disrupt, this makes Jupiter the very definition of a hard target if you’re trying to blow the thing up. You may recognise this graph because I’ve used it roughly half a dozen times before; it’s a computer model of how an object’s critical energy density (read: the amount of energy you have to hit it with to blow it up) varies with object size. Note that despite being composed of two vastly different materials – ice and basalt – the models are practically identical past object diameters greater than 1 kilometre, meaning that it doesn’t matter what your target body is made of. It can be a rocky terrestrial planet like the Earth/Alderaan, or it can be a big gas giant like Jupiter; all that matters is how much mass is contained within the target, and hence how strong it is gravitationally. 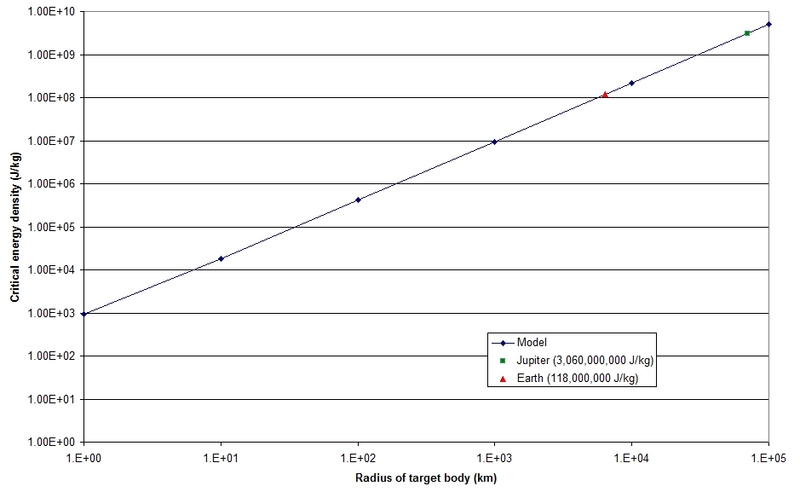 Now, let’s extrapolate that model out to Earth- and Jupiter-scale bodies. Sorry for the rather rough Excel graph; if I had any other graphing software that wasn’t Origin I’d use that instead. This model has several caveats: in the absence of any other data I’ve used information for the 5 km/s impacts onto basalt, and while I do not think the overall density of the body will have an effect on how hard it is to disrupt the same can’t be said for impact velocity. Jupiter in particular is at the bottom of an extremely deep gravity well, and so any body colliding with it is going to have quite a hefty impact speed – the Shoemaker-Levy comet fragments hit at velocities of around 60 km/s, for example. 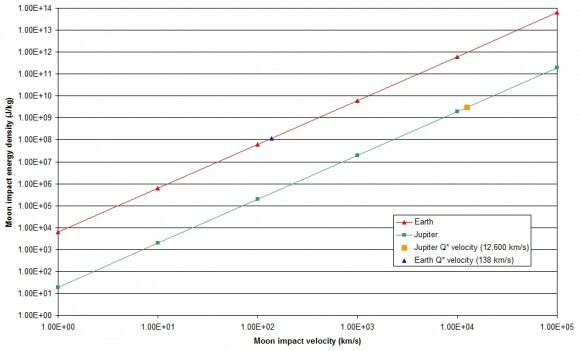 Faster, more energetic impacts are actually slightly less effective at disrupting a target than slower ones thanks to the way cracks propagate through a solid medium, so I doubt using data for 5 km/s basalt is going to be particularly accurate, but it should at least allow us to ballpark the critical energy densities of the Earth and Jupiter. Some numbers. The critical energy density required to disrupt the Earth is 1.18 × 108 J kg-1. The critical energy density required to disrupt Jupiter is some 26 times larger at 3.06 × 109 J kg-1. Our two scenarios are a) firing the Moon at either body and trying to disrupt them that way, and b) hitting them with an unspecified number of Death Stars. 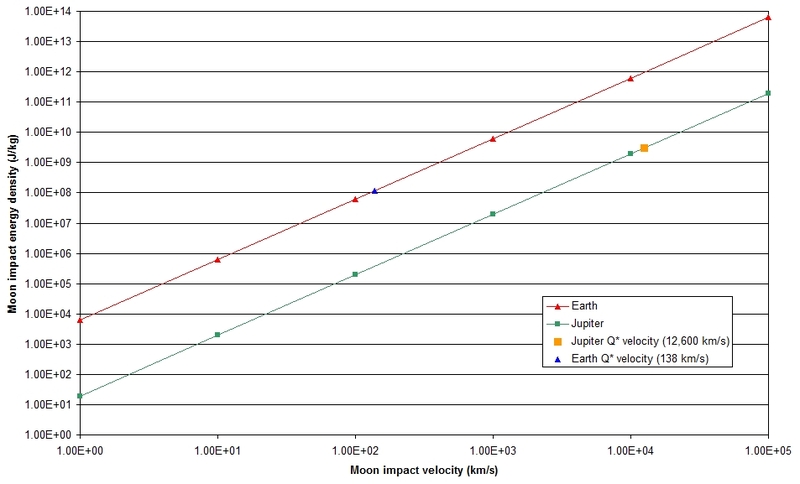 Scenario a) is easy1 to figure out; you just calculate the impact energy of the Moon given its likely impact velocity and then divide it by the mass of the target. This is what we’d have to do to destroy each body, then: fire the Moon at the Earth at a rather nippy 138 km/s, and fire it at Jupiter at around four percent of the speed of light. These impact speeds are rather unlikely, to say the least; comets can hit the Earth at velocities of up to 70 km/s but those come all the way in from the Oort cloud and have a lot of time to pick up speed. Something as large as the Moon would get nowhere near those velocities; it would do serious damage to the Earth (and somewhat less to Jupiter) but each planet would eventually recover after a few million years or so. Then you have the Death Star scenario. This is even easier; if we assume that one Death Star can destroy 2 Earths (as established in the opening paragraph) then it would take the power of 4,000 Death Stars to destroy Jupiter. As far has hard numbers go, one Death Star has a destructive power roughly equivalent to 300,000,000,000,000,000 one megaton nuclear weapons focused into a coherent beam. Isn’t it great what we can achieve with science? Awesome. I love science! I shall pass this on to people at work so that they too can marvel at the wonders of science!